This modern spacious 2 storey villa boasts 6 bedrooms and 5.5 bathrooms over 3,560 sqft. In the heart of Kissimmee, the villa is conveniently located between Disney World & Universal Studios. Spanning two floors, this high-end villa has everything you need in a vacation home. 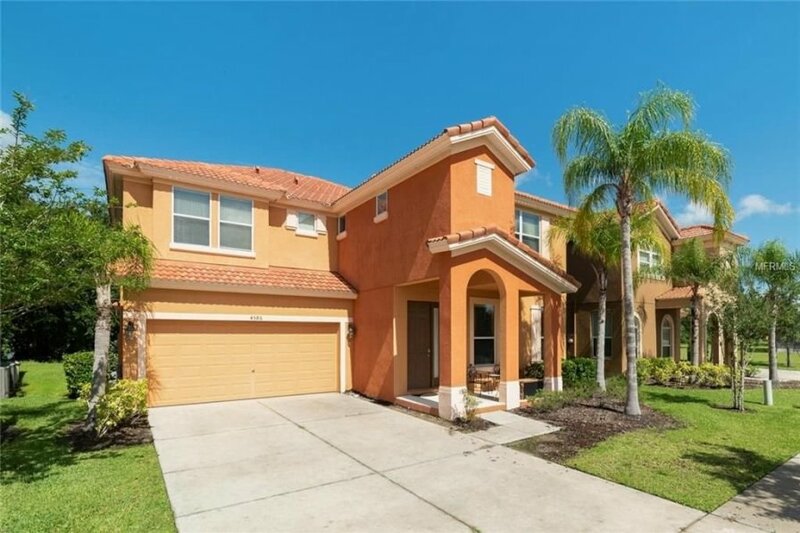 Situated in the heart of Kissimmee, on 15-acres of stunning community lakes, this villa stands proud on a secure gated community offering free access to a gym, cinema, outdoor sports area, communal pool, volleyball court and fishing dock. This modern spacious 2 storey villa boasts 6 bedrooms and 5.5 bathrooms over 3,560 sqft. The living room contains a large 11-seater sectional sofa, large flat screen television and 4-seater dinette table. Upon entering the spacious kitchen come dining room you have a breakfast bar seating area for 4 people, an 8-seater dining table, a full size billiards table, hangout and bar area with a large flat screen television. The kitchen comes equipped with an array of stainless-steel appliances, a modern French door refrigerator, granite countertops, cookware and plenty of dinner and service wares. Situated towards the rear of the property, you will find your heated private pool and spa area. Poolside, your family will enjoy many evenings dining al fresco under a covered lanai with additional table seating for 4 and 3 sun loungers. There is also a shower and toilet area conveniently located poolside. Upstairs you will find all 6 bedrooms evenly spaced out. There are 3 master suites with en-suite bathrooms, 1 bedroom with a full-size bed and 2 rooms having 2 twin beds. All bedrooms come complete with flat panel TV’s bed linen and bath towels. This 2-story villa has everything you want in a vacation home, including free WIFI and more! You will have plenty of space to relax with your family and friends without disturbing each other and enjoy your holiday.